These days, getting kids to focus on God instead of their iPhones takes nothing less than supernatural intervention. Loving God and following him often makes you look weird to your neighbors. The Willitses understand the struggle, and in their very first book, they share their energetic, humorous, and imperfect attempts to live out their faith in today’s world. Sometimes it helps to know that others are on the same narrow path as you, stumbling just as you do. 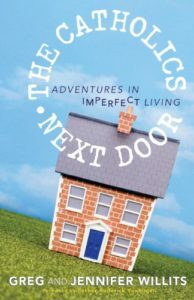 Greg and Jennifer Willitses’ view of the world covers the gamut of daily life, from kids and comic books to marriage and dealing with technology, and shows readers that you don t have to be perfect parents with perfect kids to be good Catholics. If you’re like many Catholics today, you love the Church and you long for others to know the peace and joy you’ve experienced. But how can you communicate it? Greg Willits is passionate about helping you share your faith. He’s explored all kinds of ways to reach out–from radio and TV to various forms of social media–and he’s learned a lot about what works and what doesn’t. 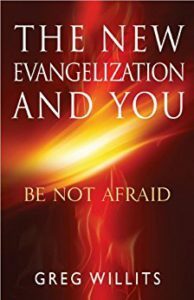 The New Evangelization and You: Be Not Afraid encourages Catholics everywhere to first know their faith, and then to live it and share it authentically with others. Many Catholics have heard the phrase “New Evangelization” but don’t know what it means or how they might apply it in their lives. The New Evangelization and You clearly explains what the New Evangelization is and how it applies to every Catholic, and examines realistic ways to make the New Evangelization a part of each Catholic’s daily living. While explaining the goals, history, concepts, and action items of the New Evangelization, the book spotlights other Catholics already making a difference by the ways they share their faith and inspires readers to embrace this call in their own lives. This book is meant to light a fire under every Catholic and to inspire an active response of faith. Experience the joy of knowing faith, living faith, and sharing faith. From snarls in the workplace to hitches on the homefront, most of us find ourselves shaking our heads thinking: Is there any way to untangle this mess I call life? 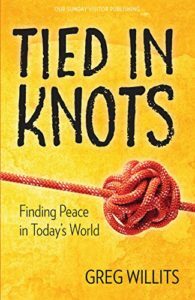 Greg Willits, Catholic author, media trailblazer, husband, and father, has experienced his share of knots, and he s here to assure you that there s no tangle you can t undo provided you have the right tools. Greg becomes your friend and (sometimes hilarious) companion in this endeavor, sharing his own experiences and those of others, as well as Scripture and Catholic teaching, walking along side you as you begin to untie the knots in your life.